You know that I don’t think it’s ‘luck’ that allows a person to travel. I think you have to have your eye on the prize, be willing to make sacrifices, and save, save, save! Travel doesn’t have to be expensive; and saving for travel doesn’t have to be painful. The cost of a trip varies greatly depending on where you want to go. Europe is notoriously expensive but I’ve heard that bargains can be found in northern Italy and Spain. We found Vietnam and Laos to be as cheap as legend says they are but we’re expecting Japan to cost us a pretty penny. Overall, long term travel is cheaper than short term vacations. Distances between even major destinations are much shorter than traveling from ‘home’ and back every time. Local air carriers can be used and even ground transportation is possible. Mindset is different for long term travel also; without the need to do it all while you’re on vacation, you can relax and take things at a slower, less expensive, pace. Warren and Betsy of Married With Luggage run the RTW Expenses site solely to provide information on what it has cost them to travel long term. Lauren of Never Ending Footsteps also posts a monthly summary of her finances on the road. Mostly Asia so far but I know she has recently been in Europe and is currently in Africa! Jeremy of Living The Dream has a detailed account of every dime he spent while traveling. With lots of Asia and Europe in his travel resume he gives some great balance to the budget. The Aussie Nomad focuses on Europe in this series of daily budget posts. There is often plenty of information on Europe and Asia whereas South America and Africa budget posts are harder to come by. Simon and Erin have a great round up from their time in South America. I also have budget series from our RTW trip as well as a detailed spreadsheet of what we spent in the 14 countries we visited. I’m planning the same kind of detail for Japan; I’ll be sure to post it once we’re back! It’s important, when visiting these sites, to not just read the budget posts. You need to get a sense of who is spending this money; are they uber-budget-backpackers who would happily sleep in a 13 person dorm room, or luxury travellers for whom 3 star hotels are an abomination? I always get to know the writer and make sure that they travel in a way that is comfortable for me. Which brings up probably the most important point; be honest about how you are willing to travel. Don’t plan on a backpacker budget if that’s not really how you travel – you’ll be miserable on $25/day and will begrudge every dollar over that you spend. It doesn’t have to cost a lot to travel but it’s worth saving what you’ll need to travel happily. Open a dedicated savings account. Name it. Our current one is called OneGiantStep Goes To Japan. Think about what you’re spending. Those two beers tonight? That’ll easily pay for a bungalow for a night on a Thai beach. Put all ‘extra’ money into the account. Pocket change, birthday money, pennies from the couch, anything extra. It all adds up. Get a side job . Paper route? Barista? Slinging beers? Freelance writing? Whatever talent you have – pimp it! Connect to the saving. Keep that trip forefront in your mind – post pictures, use screensavers, read articles/blogs- it’s easier to save if you are always thinking of the end goal. Know how much it’s going to cost. You have to know the goal! Sell stuff. What is in that spare room anyway? Do you really need that second set of golf clubs? What about that pile of books? That snowboard you didn’t use at all last year? Keep track of what you make AND what you spend NOW, before you go. It’s much easier to keep track of what you’re spending while travelling if you’re in the habit of doing it before you leave. We’ve traditionally used spreadsheets for this but recently have started using Mint.com – it’s integrated with your banking and credit cards to help track and categorize spending. You can set budgets with it and know if you’re overspending in a certain area – it’s a great tool to get a handle on where all those dollars are actually going as opposed to where you think they’re going.And don’t forget about the free tax software that’s available too – remember, every penny counts!! If you plan properly and honestly, put some effort into saving, and sacrifice just once in a while, you too can be ‘lucky’ in travel! Share your saving-for-travel tips below…how are you getting lucky? You are absolutely right! It’s all in your own priorities. Some save for a weekend splurge in Vegas, others for a plane ticket halfway across the world. We’ve been logging our expenses down to rupees and dongs on this trip and it’s help to keep us on track – eye on the prize – as you put it. :D great post! Great tips! There are so many ways of saving for travel, so many unnecessary things people (myself included I’m sure) spend money on that could easily be skipped in favor of saving that money. If travel is a priority, you do what you have to to make it happen. I think it’s fine to spend the money – even on ‘unnecessary things’ – but don’t be doing that and then wonder why you aren’t traveling! Mint.com is a great site. I used to recommend it when I was teaching financial literacy. We are also making a big, but doable, sacrifice and selling our one and only car soon. It’s been a major hindrance in taking the next step in our savings and I’m ready to be done with the stress and financial burden of owning a car…esp. an older one. Thank goodness I get a free bus pass from work and Portland has amazing public transportation. Wow, that’s a big sacrifice Carmel! We actually had to buy a second car since moving to Calgary…’Budget Girl’ was not happy about that one! Great post! Our friends and family often call us “lucky” for being able to travel, and it’s hard for them to understand how much we sacrificed, and how hard we worked for YEARS to make this happen. The best part is, now that we know we can do it, it makes setting, and meeting, other financial goals seem easier. I think it does get easier and easier. Success begets success. Thanks for including the link to our South America budget post. We don’t travel on a super tight budget so it’s a good indication for those who want some comforts now and again (and who doesn’t want a fancy apartment in Buenos Aires?!). I definitely agree it isn’t luck at all. Tracking your expenses is vital to know where your money is going. 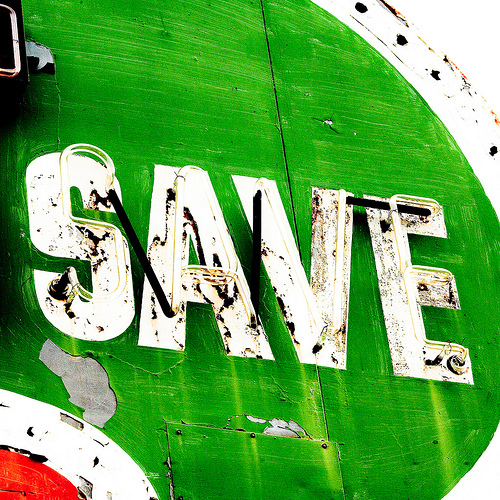 We found saving got easier over time and we grew to have no urge to buy stuff – we still find shopping difficult. Or an apartment in Tokyo?! We’re staying in the same apartment you did in Tokyo – more power for blogger recommendations! I, too, find shopping difficult. I find I just don’t need as much as I used to. These are all good tips which applies to saving for anything really. It’s all about having a firm grasp on your finances and having a set goal in mind. I like the tip of thinking of costs in terms of one day of travel. I usually think about $50 as the figure, so I’m always like “I could spend $50 on dinner or on a new top/kitchen appliance/gas/whatever, or I could be on a trip an extra day. 30Traveler recently posted..How Does Your Politics Influence Your Travel?